What’s So Great About Hyaluronic Acid? Hyaluronic acid (HA) in skincare is the newest craze to hit the mainstream market. We are seeing this ingredient everywhere! And we mean, EVERYWHERE. HA, believe it or not, is actually a substance that’s naturally present within the human body. It holds water in our skin to keep it hydrated and plump. HA provides continuous moisture for the skin by binding up to 1,000 times its weight in water within the cells of skin. However, just like naturally produced collagen in the skin, as you age the natural amount of HA produced in your body decreases. Fortunately, HA can be used as moisturizer and to help prevent joint pain. In the past decade, there has also been increased interest in using it to prevent the signs of aging. That’s when the beauty market exploded with all different strengths and brands of HA. Pure haven hyaluronic acid is one of the few non toxic products on the market, not to mention affordable! Seriously, the price of this product is blowing beauty editors’ and consumers’ minds! 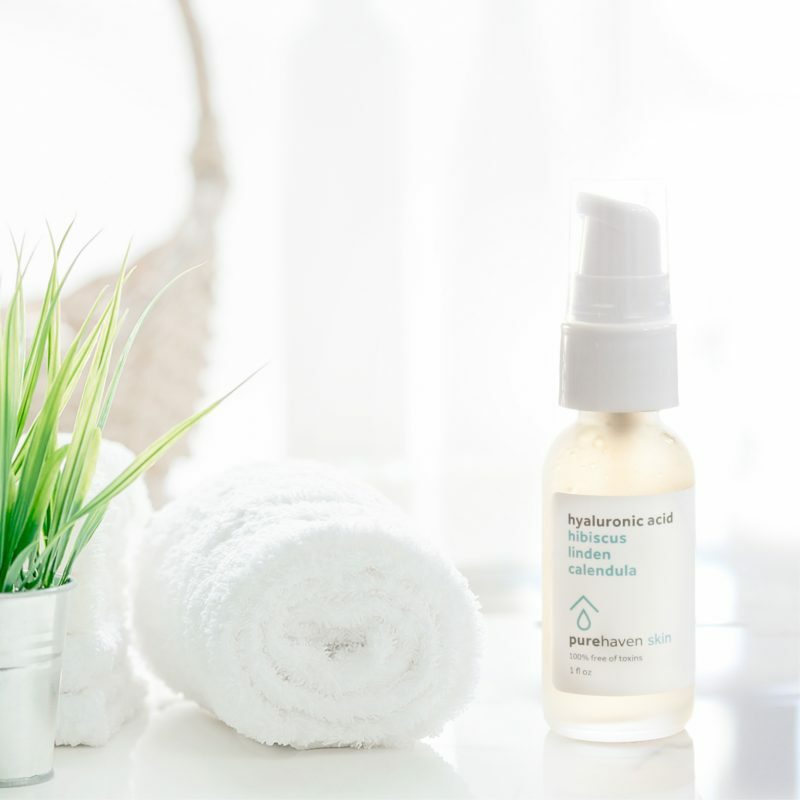 Pure haven’s percentage of hyaluronic acid is noted at an astounding 3%, which is double the amount that most designer and drug store versions contain. Switching to a non-toxic HA is a decision that your body and skin will thank you for. It will leave your mind at ease knowing that pure haven’s HA does not contain any harmful chemicals such as parabens, formaldehyde, and many others. Through April, pure haven is offering a free full-size HA with any purchase of $95 or more! Your skin is capable of absorbing around 60-80% of what you put on it, so it’s important to nourish your skin with non toxic products. Trust us, once you try this product, you’ll never want to be without it again.